Slackers rejoice. Because of judging logistics, we’ve extended the final deadline for general entries to midnight September 14th. The Chile Beer Category deadline is September 22. We have new and exciting categories this year. Pre-made tamales and pre-packaged chili categories have been added, as well as a “unique” subcategory to all the main categories. Adding the “unique” subcategory will give you more chances to win with all of your products. Enter four products or categories into the contest and pay for only three–-the fourth entry is free. Enter seven and pay for only five–-2 entries for free. These bonus entries can either be additional product(s) or the same product(s) in additional categories. 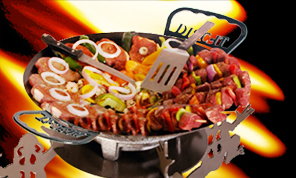 As with the 2012 Scovie Awards, the grand prize winners in the Tasting Division and the Advertising and Marketing Division will each win a Disc-It, the versatile outdoor grill! Each will be customized with the winner’s names on the handles. You can find the rules and entry form on our website. If you have any questions, please visit our website or feel free to call Emily DeWitt-Cisneros at (505) 873-8680. She is here to help!